A Whirlpool double oven has two separate cooking compartments with different control panels for each, so you can cook multiple dishes at different temperatures. The oven features a self-cleaning mode, broilers, a delay bake mode and convection conversion. 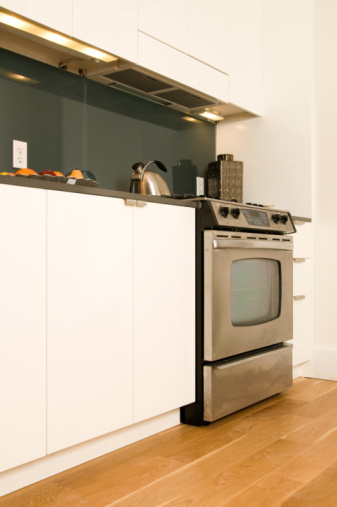 If you have a problem with your Whirlpool double oven, you can troubleshoot the appliance. If troubleshooting does not resolve the problem, contact Whirlpool's customer service line. Find out whether the Whirlpool double oven is getting power. A blown household fuse may be the cause for loss of power. Additionally, you may need to reset the circuit breaker in your home. If the oven is not wired correctly, you may need to call in an electrician to fix the problem. Select "Clear" to erase any settings you have previously entered. For instance, "Delay Start" will prevent the oven from operating. After clearing the settings, make sure you choose either "Upper Oven" or "Lower Oven" before entering your new settings. Make sure neither oven is in the self-cleaning mode. If one of the ovens is self-cleaning on the Whirlpool double oven, you will not be able to use the other. Additionally, you can not self-clean both ovens simultaneously. Calibrate the temperature of your Whirlpool double oven if the cooking temperature seems too hot or too cold. To calibrate, hold down the "Bake" key until the current calibration is shown on the display. Then choose "Upper Oven" or "Lower Oven." Press "Broil" to lower the temperature in 5 degree increments and "Bake" to raise the temperature in 5 degree increments. Level the appliance if your food cooks unevenly. To check whether the oven is level, place a standard level in the center rack while the appliance is not in operation.